Gabon began their Africa Cup of Nations campaign with a win over 2013 runners-up Burkina Faso to go top of Group A.
Borussia Dortmund striker Pierre-Emerick Aubameyang opened the scoring with a cool finish from inside the penalty area before the break. Burkina Faso were dangerous throughout with Vitesse Arnhem's Chelsea loanee Bertrand Traore being denied by goalkeeper Didier Ovono in both halves. But Malick Evouna sealed the win with a 72nd-minute header. The win puts Gabon top of Group A after the other game in the group ended in 1-1 draw between hosts Equatorial Guinea and Congo earlier in the day. 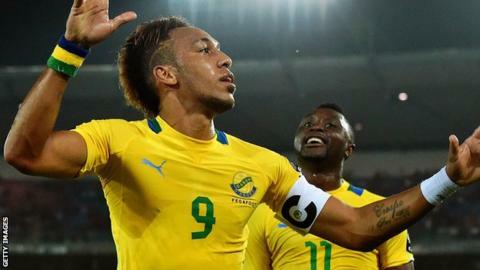 Aubameyang has bagged three goals in his last three games against Burkina Faso. After winning only two of their first 26 Nations Cup matches, Burkina Faso went all the way to the final in 2013 before defeat by Nigeria. They started the 2015 tournament encouragingly as 19-year-old Traore, on loan at Dutch side Vitesse this season, saw a fierce volley parried away by goalkeeper Didier Ovono. But, against the run of play, Aubameyang showed his quality as he kept his cool to side-foot the ball into the net after Andre Poko's pass. Counting penalty shootout defeats as draws, Gabon have lost only one of their last eight Africa Cup of Nations matches but were slightly fortunate to be ahead at the break as Traore threatened constantly. It was Burkina Faso who again looked more likely to score after the interval but, after Traore's close-range shot was blocked by Ovono, Gabon made sure of victory. Charlton's Frederic Bulot advanced down down the right and his cross was headed home by Evouna to seal victory. Burkina Faso coach Paul Put: "We dominated the first half and created clear chances, but unfortunately Didier Ovono was very strong today and he won the points for Gabon. "If you can't score goals, you can't win matches. That's the rule of this game. "It's a shame, but that's the way it is. In the second half we tried to keep going and had more chances. You need luck and patience in front of goal if you are to score, but that wasn't the case for us." Match ends, Burkina Faso 0, Gabon 2. Second Half ends, Burkina Faso 0, Gabon 2. Corner, Gabon. Conceded by Mohamed Koffi. Corner, Gabon. Conceded by Germain Sanou. Attempt saved. Frédéric Bulot (Gabon) left footed shot from outside the box is saved in the top left corner. Assisted by Johann Diderot Lengoualama. Offside, Gabon. Frédéric Bulot tries a through ball, but Johann Diderot Lengoualama is caught offside. Attempt blocked. Johann Diderot Lengoualama (Gabon) right footed shot from the right side of the box is blocked. Assisted by Samson Mbingui. Attempt blocked. Jonathan Pitroipa (Burkina Faso) right footed shot from the centre of the box is blocked. Assisted by Narcisse Bambara. Attempt missed. Bertrand Traore (Burkina Faso) left footed shot from the right side of the box is close, but misses to the left. Assisted by Prejuce Nakoulma. Attempt missed. Alain Traoré (Burkina Faso) left footed shot from outside the box is too high. Assisted by Bertrand Traore. Substitution, Gabon. Johann Diderot Lengoualama replaces Malick Evouna. Guélor Kanga (Gabon) wins a free kick on the right wing. Foul by Narcisse Bambara (Burkina Faso). Foul by Yrondu Musavu-King (Gabon). Aristide Bancé (Burkina Faso) wins a free kick in the attacking half. Samson Mbingui (Gabon) wins a free kick in the defensive half. Foul by Samson Mbingui (Gabon). Charles Kaboré (Burkina Faso) wins a free kick on the right wing. Substitution, Gabon. Samson Mbingui replaces Lévy Madinda. Attempt missed. Aristide Bancé (Burkina Faso) right footed shot from outside the box is close, but misses to the right. Corner, Burkina Faso. Conceded by Bruno Ecuele Manga. Attempt saved. Alain Traoré (Burkina Faso) left footed shot from outside the box is saved in the top centre of the goal. Substitution, Burkina Faso. Prejuce Nakoulma replaces Djakaridja Koné. Johann Obiang (Gabon) is shown the yellow card for a bad foul. Foul by Johann Obiang (Gabon). Bertrand Traore (Burkina Faso) wins a free kick in the attacking half. Offside, Gabon. Johann Obiang tries a through ball, but Malick Evouna is caught offside. Goal! Burkina Faso 0, Gabon 2. Malick Evouna (Gabon) header from the centre of the box to the top left corner. Assisted by Frédéric Bulot with a cross. Attempt missed. Pierre-Emerick Aubameyang (Gabon) right footed shot from the left side of the box is close, but misses to the right. Assisted by Malick Evouna following a fast break. Attempt missed. Malick Evouna (Gabon) right footed shot from the right side of the box misses to the left. Assisted by Lévy Madinda. Substitution, Burkina Faso. Aristide Bancé replaces Jonathan Zongo. Pierre-Emerick Aubameyang (Gabon) wins a free kick in the defensive half. Foul by Mohamed Koffi (Burkina Faso). Attempt saved. Bertrand Traore (Burkina Faso) left footed shot from the centre of the box is saved in the bottom left corner. Attempt saved. Frédéric Bulot (Gabon) left footed shot from the centre of the box is saved in the centre of the goal. Assisted by Pierre-Emerick Aubameyang. Substitution, Gabon. Guélor Kanga replaces Didier Ibrahim Ndong. Attempt missed. Alain Traoré (Burkina Faso) left footed shot from outside the box is close, but misses the top left corner from a direct free kick. Foul by Andre Biyogo Poko (Gabon).